In light of Walmart’s track record of mistreating its women workforce, Making Change at Walmart (MCAW) and the United Food & Commercial Workers (UFCW) Secretary-Treasurer, Esther Lopez, sent a joint letter to Melissa McCarthy, Dee Rees, and Nancy Meyers, urging them to stand up for the rights of working women and end their Oscars Awards partnership with Walmart. The letter from MCAW was in response to the three prominent female celebrities’ partnership with Walmart to produce the company’s television commercials that will air during the Oscars Awards ceremony. As part of the effort to highlight Walmart’s track record, MCAW is also publishing a full-page ad in today’s edition of Variety magazine. “While at face value this would seem to represent a positive campaign, we urge to you look at the facts about Walmart’s past actions that reflect on its values. Values that have had a negative impact on countless women and their families, and that send a terrible message as to what behavior is acceptable if we are serious about social equality and justice,” said Lopez in the letter to the three Hollywood filmmakers. 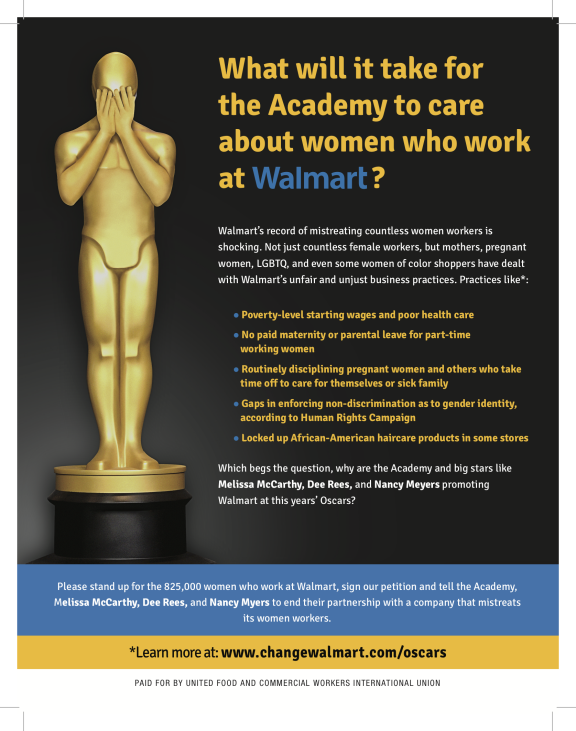 As part of an effort to raise public awareness of Walmart’s record on women, MCAW is launching a multifaceted campaign which will include ground actions leading up to this year’s Academy awards, a targeted social media campaign, and paid media, such as this week’s Variety Ad. Additional announcements about the next phase of the campaign will be made in the coming days. “We admire Ms. Rees, McCarthy, and Meyers for their work, and we urge them to do what is right and speak out against Walmart’s record. No actor, especially ones as talented and passionate as these, should ever allow themselves to be used by Walmart to hide the truth about how they treat women. It’s time for Walmart to change, and Ms. Rees, McCarthy, and Meyers can be a powerful voice for that change.” said Lopez. A copy of the Variety ad and the letter sent to Ms. McCarthy, Meyers, and Rees can be viewed above and at changewalmart.org/oscars.